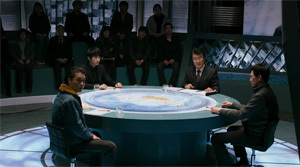 Review: Seldomly you get an action thriller out of Korea that delivers as much as "Confession of Murder" does. To be exactly, there is really nothing it lacks. The complex story is smart and has numerous surprising twists up its sleeve, it has a breakneck-pacing, the chasing scenes count among the best ever seen from the country, the drama isn't falling by the wayside either and a good amount of media satire is also to be found. It is astonishing that all of this fits together somehow. Oftentimes there is the fear that the film might get off course but in the end that is never the case. What's especially laudable is, next to the complex story, the action that never leaves you with room to breathe. There isn't a single moment without happening something. That's exactly how a well-achieved action thriller should look like. While the story and the action unfolded on screen, I was pretty sure that director Jang Jin had to be the man behind the movie. The way the media is made fun of, which celebrates a murderer and makes him a cult figure, as well as the picture of society that lets itself get carried away by this personality cult, and not only teenagers who have found a new pop star in him, were reasons for that assumption. The omnipresence of media reminds us of Jang's "Murder, Take One" and also of "Going by the Book", in which Jeong Jae-yeong played the leading role as well after all, even thogh "Confession of Murder" is a lot more serious and bloody. But not Jang Jin is responsible for the movie but newcomer Jeong Byeong-gil, who before that only shot the docu "Action Boys". An impressive debut he delivers here. The thriller already starts very action-loaden with a chasing scene through narrow alleys in which very dynamic and unusual camera work instantly manages to capture you. Later on the camera is also virtually glued to the protagonists during the action scenes, without any details getting lost. In the later course of the film there are also two big car chasing scenes on a highway that are brought to screen fantastically and get the adrenline pumping through your veins. Especially the many small ideas make those action scenes something special. Eventually you even start to ask yourself how director and scriptwriter Jeong managed to implement so many good action scenes into a movie without it feeling overloaden. Storywise "Confession of Murder" is crammed as well, even to the degree that you easily could have made several movies out of it. And yet the viewer doesn't need to deal with countless names and entanglements that aren't easy to follow, which normally are a frustrating aspect of such movies. Jeong presents his complex story in an easily comprehensible manner and draws it out in bits and pieces, making it easy to follow. Furthermore, the story is extremely mulitlayered, because aside from the detective and the murderer there are also the family members of the victims that are woven into the story. In places you don't expect it the thriller can also be quite funny, but every now and then it is also pretty bloody and therefore constantly reminds you of the serious nature of the plot, which eventually also serves as the groundwork of the drama. You can't claim that "Confession of Murder" is without flaws, though. For instance, there is the unnecessarily stylish introduction of the daughter of one of the victims or the fact that despite all the aforementioned there are still a few small cracks in the movie's tone. But the fast-paced action scenes and the constant unfolding of the story, that continuously rewards the viewer with new findings, as well as the media satire are fully convincing. Actor Jeong Jae-yeong and Park Si-hoo as the antagonist, before that latter one was only to be seen in drama shows, do their share as well to keep the film together despite being a giant genre mix. You can't get rid of the feeling that here several movies have been realized in just one and yet "Confession of Murder" makes up a fine movie as a whole that has something in store for everyone. The best action thriller out of Korea in years!